The total production of meat stands at 4.52 million MT nationally in 2014 against the demand for 6.73 million MT. The standard meat consumption should be 120 gm/ day whereas average intake is 80 gm/ day only. Again, standard milk consumption should be 100 ml/ day whereas average intake is 80 ml per person/day. There is a clear deficit present in the supply side. There has been a wide range of cattle varieties popular for beef production in different regions of the world; some of them are Angus, Belgian Blue, and Brahman etc. The average weights of them are 700 Kg, 800 Kg, and 850 Kg respectively. Among the dairy varieties, the world’s topmost milk production source is the Frisian which has milk capacity of 60 liters/day. So, cattle development has a huge scope in Bangladesh. Since 1975, meat and milk production have been developed through cross-breeding. But till date, only 34% of the cattle have been developed into cross-breeds. The crowdsourcing livestock platform of iFarmer will allow govt. 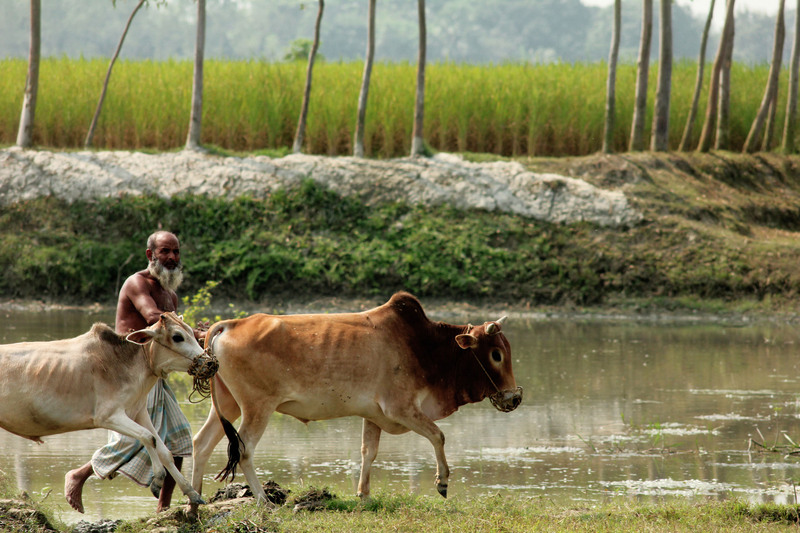 & private sector to work more closely to improve the future of cattle in Bangladesh. The rate of increase in the price of beef has consistently exceeded inflation for the last 20 years. This trend is set to continue as more people enter the middle class and demand healthier protein. As iFarmer, our target customer is the health conscious, high-end consumer market where healthy margins can be secured so as to provide a consistent return for sponsors and farmers who supply us with calves. We are creating strong partnerships with farmers to smooth the price volatility to ensure consistency in supply and pricing. We do not contrast against breeds; however, our expert team of professionals carefully select calves based on their ability to gain weight when fed a certain quantity of grass. What should be my expectation from Cow Sponsorship? On completion of your sponsorship, you will be allocated a calf and issued an ownership certificate bearing your name and the unique number of your calf on a specific farm. Then iFarmer will work as your Cow portfolio manager for a fixed time period, and before the contract period ends you will receive your basic sponsorship along with dividend. What iFarmer offers as my Cow Portfolio Manager? Team iFarmer purchases the cow for you, bears the cost of management, provides insurance for death or loss, maintains the farm, grass - which is the food for the cows, supplementary feed and, medicine and vaccinations. What will be your return policy if the cow dies or anything unwilling happens? If your cow dies we will replace them, all sponsorships in the iFarmer platform are being insured by us. It will be replaced by another one. In this way the death of your cow will not affect your dividend from the sponsorship. What will be the mode of payment and how are you going to disburse it? Once the life cycle ends you will receive your basic sponsorship amount and dividend in your designated bank account. Once the payment is done we will deliver you the 'Certificate of ownership' and your bank details. Is the return amount fixed? or can that vary? No, it’s fixed return we are offering to our sponsors. How many cows can a person buy? One person can buy a maximum of 4 cows or on shares worth maximum BDT 1,20,000. Can anyone sponsor from outside Bangladesh? Yes, but it's not enabled yet we are already working on international transaction process. Keep an eye to our website for a further update. Does the price of cow increase over time? Yes. The price of beef today is double what it was five to seven years ago. It is, therefore, safe to forecast that the value of your cows will also grow in the same measure over the next few years. Your sponsorship also grows with the growth of the physical weight of the cow over time as well as the general appreciation in the price of beef. This is why the cow is a great store of wealth. Can I visit the farm/ farmer managing my cow? Yes you may. You only have to inform us in advance to ensure that you get the best welcome possible. What are the benefits of sponsoring in iFarmer? The joy of owning your own cattle. You are contributing to food security by sponsoring in agriculture. The cows eat grass and grow regardless of local and world politics. You are creating jobs where they are needed the most. You make a good return on your money whilst enjoying all of the above benefits. Team iFarmer understands the value of your time, faith and money. Our team continuously appraises your sponsorship for something much greater than monetary return. iFarmer allows you to take back your sponsorship within 1 week with 100% refund. iFarmer team consists of sector experts with professional experience working in various high valued national and international projects. Each spnosor will be provided with a Certificate of Ownership Farm (COF), which also explains the ownership of the tree with complete details. Get updates of farms every week! Join our newsletter and get news in your inbox every week! You can track new farms and plan your sponsorship this way.